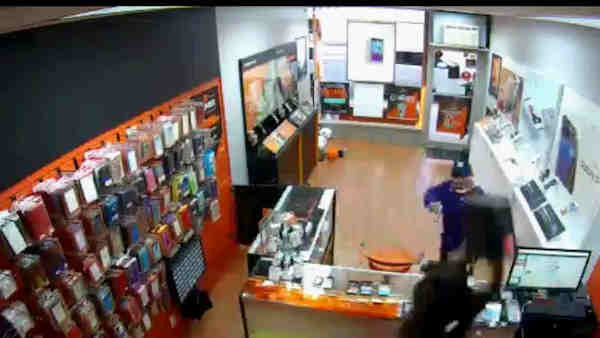 BRONX, Manhattan (WABC) -- A would-be robber changed his mind after an employee at a Boost mobile store fought him off. According to the New York City Police Department, at 7:45 p.m. July 15, a suspect went into a Boost Mobile store at 25-38 Broadway in the Bronx. He had a silver hand gun and told the employee not to scream and to give him money, police said. But she did scream and began to throw random objects at the suspect. He went behind behind the counter and tried to force her to open the cash register, but she kept throwing things at him, police said. The suspect finally fled without taking anything. The employee was not injured. He is described as a Hispanic man, wearing a long-sleeved purple shirt with METRO PCS written on it, black shorts, black sneakers, a black Yankee baseball cap and dark sunglasses.